Some New Zealand place names can look daunting when you first arrive. Let's start with a whopper: Taumatawhakatangi­hangakoauauotamatea­turipukakapikimaunga­horonukupokaiwhen­uakitanatahu. Awesome eh? It's the name of a hill in Southern Hawkes Bay in the North Island of New Zealand. It is the longest place name in any English speaking country, and the second longest in the world. Roughly, it translates to, 'The summit were Tamatea; the man with big knees, the slider, climber of mountains, the land swallower who travelled about, played his nose flute to his loved one. Not surprisingly, the locals more commonly refer to it as Taumata, for the sake of brevity. 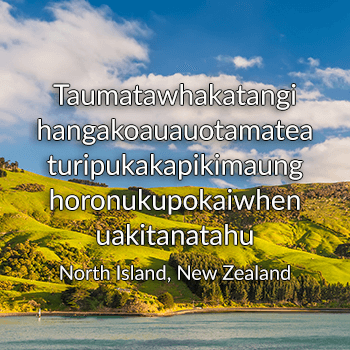 When my brother started school, he had a teacher who taught the class a syllable of the name each day, so that they would learn correct Maori pronunciation. Even though my brother is now almost 50, he can still reel it off! A bit of confusion exists around how to say Maori place names that have a 'wh' in them. As different iwi/tribes throughout the country had different dialects, some pronounced it as 'w' while others made a soft 'f' sound. An example is the city of Wanganui/Whanganui. 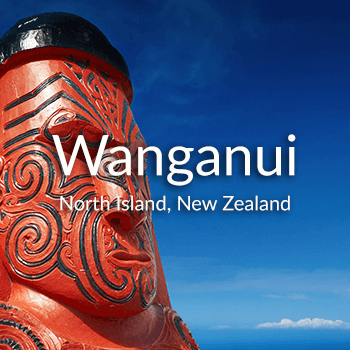 The English explorers wrote what they heard, so Wanganui was spelled without the h. In 1991, the river was officially changed to Whanganui, and in 2009, after a couple of referendums, it was deemed that both spellings of the city name would be officially recognised. That same 'wh' as 'f' can cause consternation for the new visitor to New Zealand. This winter if you are heading to the North Island ski fields on Mt Ruapehu, you may get asked if you are going to Whakapapa, which will sound like, fuk-a-papa. See what I mean? It's ok though, you'll soon get used to it. The word Whakapapa is one you will hear in other contexts as it is the word for genealogy. The 'whaka' prefix is a causative clause; to put, or place. Whakapapa translates to the process of laying one thing upon another, which when you think about ancestry, is quite a lovely way of expressing it. While many Maori place names may looked daunting, you can get a long way by knowing the vowel sounds. They work like this a: as in bar, e: as in egg, i: as the ee in free, o as is or, and u: as the o in to. Each syllable is stressed equally. So don't be shy, give correct pronunciation a go! You'll also notice that many prefixes and suffixes are repeated, so once you've got some of these staples, you're halfway there. Wai, pronounced 'why' is a very common component in many place names; Waihi, Waitangi, Waitemata, Wainuiomata, It means water, which could be a body of water, or the often plentiful rain that falls over parts of the country. Here at VroomVroomVroom, I'm always impressed at my Aussie and Philippine based workmates' knowledge of New Zealand geography and place names. Funnily enough, it isn't the Maori placenames that trip them up. Dunedin is one where I get to have a giggle, where they commonly say 'Dun-ed-din' with a short 'e' sound, instead of Dun-ee- din. Dunedin is the ancient Celtic name for Edinburgh, as the cities have long historic ties. Dunedin is frequently nick-named the Edinburgh of the South. No matter how you say them, VroomVroomVroom can get you saying, and visiting all these great spots in New Zealand, in a fantastic rental car at the best possible rate.